The Ibanez hollow-body Artcore series can capture every tint and hue in the rich spectrum of music, from the subtle shadings of jazz to the bright splashes of pop. The Artcore Vibrante, vivid in both tone and appearance, brings another bold flavor to the Artcore line and offers a unique take on semi-hollow perfection. Color Your World with the Artcore Vibrante. Ibanez AS series features a standard semi-hollow body construction for a warm acoustic tone without feedback. 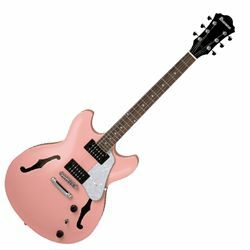 The AS63 is the most simplified model the AS series has to offer, bringing the joy of owning a quality semi-hollow guitar to everyone for an amazingly affordable price. The combination of a striking finish, white dot inlays and a white pearloid pickguard produces the look of a modern classic. The AS63 unites function and eye-grabbing looks to create a great choice for every guitarist.